We eat open sandwiches in Denmark casually out of our lunch boxes or in the evening, when we don’t want to cook a warm supper; a quick bite if we don’t have time for more. Good rye bread is vital both for texture and taste. It has to be the very dense, dark, sourdough type. My favourite approach is to slice rye bread, boil eggs, find some leftovers, then dig some tomatoes and cucumber out of the fridge and fetch the fruit bowl. Prepare the toppings then arrange them nicely on boards and serving dishes, and all sit around the kitchen table to assemble the madder of your choice. 2 Cut the aubergines into medium-sized cubes, skin on, and mix with the olive oil. Season. Bake for 20 minutes. Leave to cool. Turn oven to 220C/Gas 7. 3 Whisk the egg yolks in a bowl, then add the mustard, lemon and vinegar and whisk together for five minutes. I prefer to use a food processor or electric hand whisk for this. Gradually add about half the oil, very slowly at first, whisking continuously, until thickened and emulsified. Continue adding the oil gradually, then whisk in the baked aubergines. Season with a pinch each of salt and pepper. Store in a sterilised jar in the fridge for up to one week. 4 Meanwhile, place the ham slices on a baking sheet lined with baking parchment, and cook for eight minutes. Take out of the oven and leave to cool, then crumble them with your fingers. 5 Place the bread slices on a worktop. Slice the tomatoes and place them on the bread, then place two teaspoons of the mayonnaise on each. 6 Divide the crumbled ham on top, decorate with the watercress and sprinkle with black pepper. 1 Chop the apple and celery into small cubes and put them in a mixing bowl, then add the beetroot. Fold in the crème fraîche, horseradish and lime juice, then season to taste with some salt and pepper. 2 Place the bread slices on a worktop and spread the butter evenly on each. 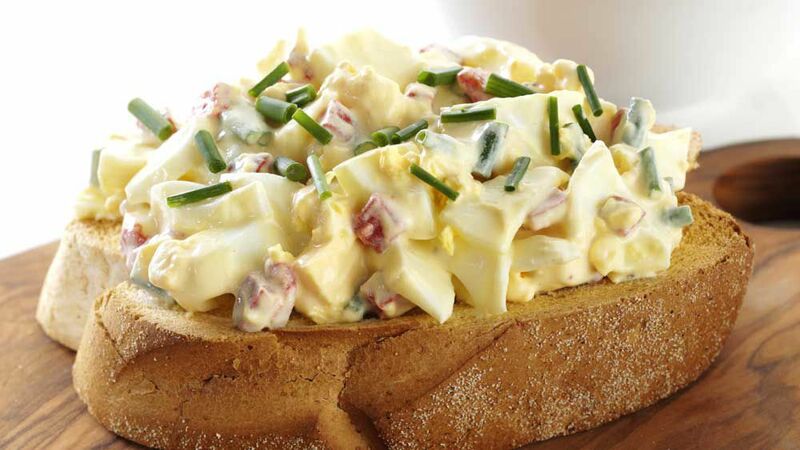 Put two tablespoons of the Russian salad on each slice, then decorate with cress and sprinkle with pepper. 1 First prepare the curried herrings. Cut the fillets into smaller pieces. Put the crème fraîche in a bowl and mix in the curry powder. Mix the apple cubes with the capers, onion and lemon juice. Season. Add the herrings to the dressing and leave them in the fridge for at least an hour. 2 Place the rye bread slices on a cutting board and spread with butter. Divide the curried herring pieces over four slices of the bread. Decorate with dill. 3 For the spiced herrings, cut the red herrings into smaller pieces. Place the slices on four pieces of the bread, alternating with slices of egg, and top with cress. 4 Finally, for the plain herrings, cut the herrings into smaller pieces. Place the pieces on the remaining bread. Top each with two to three slices of shallot and sprinkle with the chives. 1 In a small saucepan, melt the honey, add the balsamic vinegar and let it simmer for two to three minutes. 2 Halve the peaches, remove the stones and cut them into wedges. In a frying pan, fry the wedges in the butter on both sides over a medium heat, until lightly brown. 3 Toast the bread, and place the peaches on the bread slices directly from the pan. Crumble the blue cheese on top. Lightly sprinkle with the balsamic syrup and decorate with herb flowers (if using). TRINE HAHNEMANN is a Danish cook and author of The Scandinavian Cookbook. She contributes to numerous publications, including The Telegraph.